I can remember my first visit to a potato chip plant 25 years ago – stainless steel tanks, water lines, electronic controls, piercing noises, operators rushing from here to there, and that now familiar earthy aroma in the air. 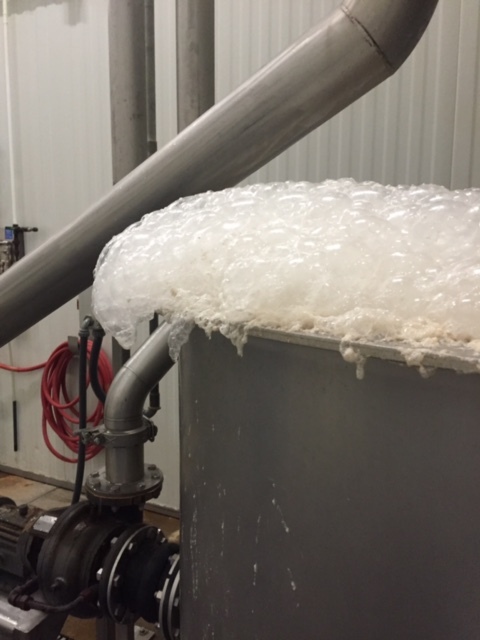 I also noticed another thing…mountains of white foam overflowing from the tanks onto the floor. I noticed that the bubbles were large in some areas and like shaving cream in others. I never considered that the foam build up, could actually shut down a plant and cause major production issues. I also received an unwanted lesson on the danger of spilled silicone based defoaming chemicals – they are slippery – I learned from my back hitting the concrete floor when I went down. Over the next 25 years of selling defoamers, I visited every type of potato processing plant selling foam-control chemicals. I met many great people at the plants and they all had one thing in common…they were tired of dealing with foam and the issues created by defoaming chemicals. As a defoamer representative, my goals were simple: keep the cost of defoaming chemicals as low as possible; limit chemical defoamer use in their system; and make the operator’s happy! In support of these goals, I have worked on everything from direct drip, inline mixing, PLC controls, needle valve systems, timers, manual pump systems, and everything in between. While running defoamer trials, I also learned that operators tend to have their own method of foam control. There did not appear to be any “by the book” protocol to control foam; it was very subjective. I also witnessed customers using the very primitive “bucket brigade”, jug and cup methods to try to control the addition of the chemical defoamers and the rate at which foam would be controlled. Many plants have attempted to control foam by using water spray, but, by and large, they were ineffective…many times creating more problems than solutions. Often, I noticed that the water sprays were generating foam rather than eliminating it. I always wondered why these sprays were not doing the job. 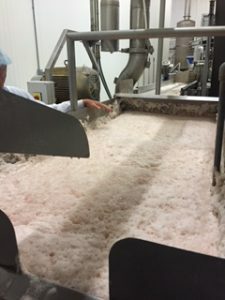 ChemFree’s initial installation of the system has eliminated the use of chemical defoamers in the plant and it has been running seamlessly for over 2 years. One of the most enjoyable aspects of my job is taking a prospect from “There is no way this will work.” (an actual quote) to “Where did it (the foam) go?” (another actual quote). ChemFree DeFoam’s team evaluates each tank, line, and process to determine the optimum configuration to control foam. The process is based on an understanding of the foam dynamics and applying the sprays in such a way to move and control foam growth. It is this systems approach that provides the foundation for the technology. An ancillary benefit that should not be discounted, is that our customers learn more about their water transport systems, tanks, and drainage during the ChemFree WDT™ system installation process. We have found that in many cases this understanding can further reduce water consumption in many systems. Reliance on chemicals for foam remediation is no longer a necessary evil. More and more companies want natural, fresh, organic and chemical free products for their customers. Chemical companies that formulate food grade defoamers and additives are also challenged by regulatory restrictions. Often, processing plants must guess or wonder what is on defoamer safety data sheets as it often states “proprietary ingredients”. The solution to this concern is to use a water-only foam control system in the plant. ChemFree DeFoam can take the guess work away on foam control with their innovative WDT™ system.